The Christmas Markets in Switzerland may not be as famous as those in Germany, but they are just as magical. It’s the atmosphere that I’m after when selecting a Christmas market to visit. Christmas decorations, the smell of delicious food filling the air and a bit of snow finishes it off nicely for me. I love to visit any Christmas market at dusk. There is something special about walking under twinkling Christmas lights that just makes me smile. In an attempt to avoid the big crowds at the weekend, we often visit Christmas markets during the week after school and work. The kids love the surprise of a change of routine and to be honest, so do I. It makes it all the more special. With its impressive Abbey in the the background, the town of Einsiedeln is a lovely place to visit anytime of year. But for 10 days in December the smell of glüwein fills the air and fairy lights twinkle above you as you stroll down the street through the annual Christmas Market. Wooden stalls line the street where you can pick up wooden toys or ornaments, winter hats, fragrant spices and everything in between. Kids can even make their own candles (in front of Hotel Sonne). But we mostly go for the treats! Our first stop is for a drink to warm up the hands: Glüwein for the parents and an orange Punsch for the kids. Then we slowly make our way down the street and check out what there is on offer. Popular in years past has been the Fakelspiess stall with its delcious pork on a long stick. Hubby can’t resist the Raclette booth (Swiss melted cheese served with potatoes or bread) and for my pickiest kid there’s always a good Swiss sausage. Don’t go home without dessert though! My favourite is Apfelkuechli (Appel in batter and then fried) with a dusting of powdered sugar. If you are looking for an extra special adult treat, visit the stand Wolke 7 for some Eierkirsch (Eggnog). Before leaving, stop by the bakery stall and prepare to line up for a freshly made Grittibanz Berliner, a freshly made jam filled donut in the shape of a Christmas Man. During the 10 days that the market is open, there are some special events you might want to experience. Visit the Abbey on the 2nd December at 5.30pm for the St. Nikolaus Aussendung, a blessing for the dressed up St. Nikolaus before he goes out and visits the children. Decorate gingerbread with your kids in the Märchen (Fairytale) tent on 2/3 and 9/10 December. You can also visit the worlds biggest Nativity Scene (Diorama) daily from 12-5 pm and at 6.45pm on the 5th December the streets will be filled with a lantern parade from the local kindergarten. You can easily reach Einsiedeln by train, about a 50 minute train ride from Zürich, with the train station right at one end of the Christmas market. If you come by car parking is well sign posted around the village but be prepared to wait during peak times such as on the weekend. 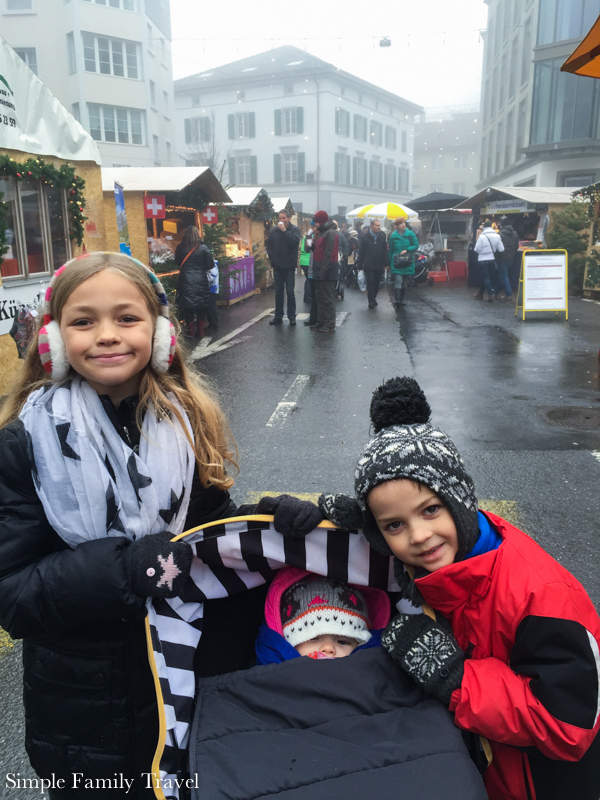 For as long as we’ve had kids, we have been visiting the Christmas Market in Einsiedeln. But last year we changed it up a bit and added the Christmas Village in Zurich to our list as well. Last year we decided to change things up a little and add another Christmas market to our list. But this time we did it without the kids. Hubby and I decided we needed an afternoon to ourselves and so we hoped on the train and headed into the big city. Yes, laugh all you want—Zurich may not be a big city as world cities go, but I live in a village with fewer than 4000 people in it, so Zurich is my big city and its always exciting to visit. There are many different Christmas market areas around Zurich but we decided to visit the Weihnachtsdorf on the Sechseläutenplatz in front of the Zurich Opera house. The wares on display at this market are a little more upscale then your standard Christmas market and the sellers change each week. But as with the Einsiedeln Christmas Market we don’t go for the things, we go for the food! If it weren’t for the Christmas decorations and the ice skating rink, you could easily mistake it for a food festival. There are around 30 different kitchen teams bringing you wonderfully diverse goodies such as fondue, salmon, Sri Lanken street food, and dumplings. There was so much food to try that it was almost a shame to go with just hubby as it was impossible to try it all. I’m thinking a visit again this year with a small group would be a lot of fun. The Zürich Weihnachtsdorf opens November 23rd at 5pm and runs all the way up to the 23rd December. These are just two on a long list of Christmas markets dotted around the country. Check out the long list on the Swiss Tourism Website. Have you ever visited a Christmas market in Switzerland? Where is your favourite?